With Cheltenham Festival rapidly approaching in the coming months, it’s time for those of us you who are attending to start thinking about planning for the event. 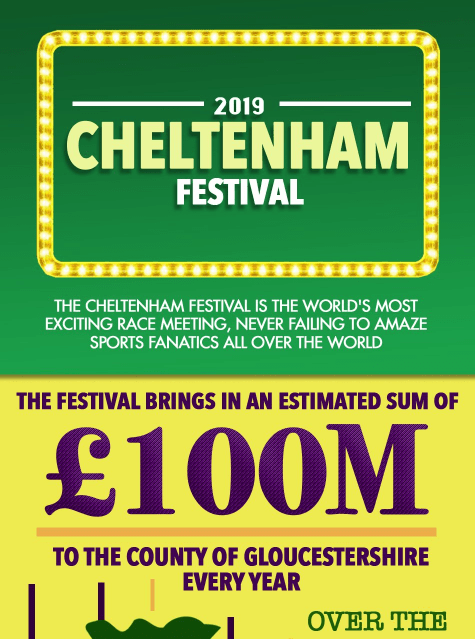 That’s why the team at The Winners Enclosure have produced this infographic telling you all you need to know about the festival. They start off by looking at the new Cheltenham Racecourse and directly compare it with the old one so that you’re able to see the key changes that have been made. Furthermore, if it’s your first time attending the festival then you might be unaware of the dress code they have there. Luckily this has been covered for you too and even highlights the fact that you can wear a fancy dress, but it must be appropriate. If you’re attending the festival at Cheltenham, then you’re more than likely going to want to place bets on horses. This infographic provides the timings of each and every race that will be taking place over the duration of the festival so that you never miss that all important event.